I was so blessed that I was able to get on the SUN train at 0.84 and 1.02. I was just watching the boring tape last 8/14 when all of a sudden, this illiquid stock got my attention from the strong price action on the tape. Seeing that it was trying to close at the ceiling, I immediately remembered that I should always buy a stock on its first day of ceiling. I also remembered from my experience that I should never fear buying a ceiling stock and just make sure that I manage my risk. Seeing that traders were buying it up aggressively, I followed suit and bought it up to 0.84 even when the stock was still at 0.83. And then of course I did my homework after trading hours. The plan was to double up if and when the psychological resistance and whole number, Php 1.00, is broken. 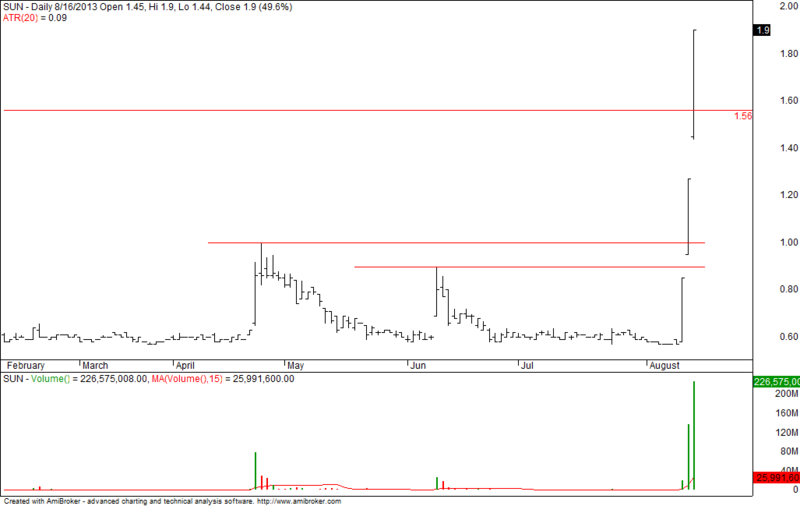 The stock gap up opened the next day and I remembered that gaps signify strong price action. 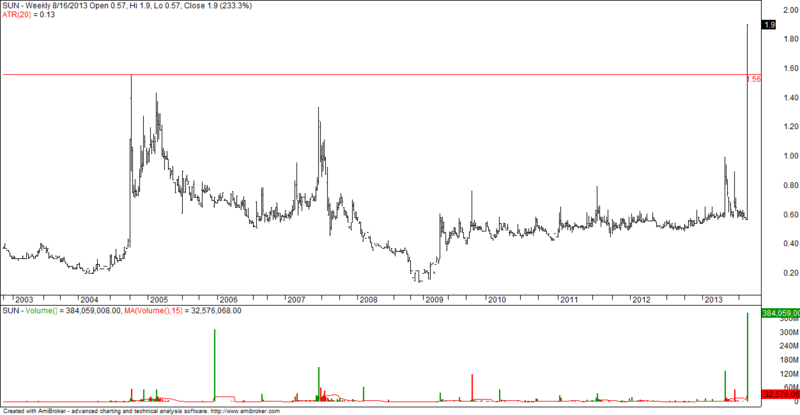 Seeing that piso, was broken like nothing, I bought it up again at 1.02 even when the stock was still at 1.00. Yes, 2 points above current price. Stocks like this are hard to buy and as long as I did my homework and I have my protective stops, worrying should be set aside. My average cost is .93. Price is now 1.90 and it led to an increase of 10% in my YTD gains. As a trend follower, I wouldn’t want to predict the top of SUN. I will just let my profits run and trail my stops. :) This is the opportunity for me to push my gains this year! 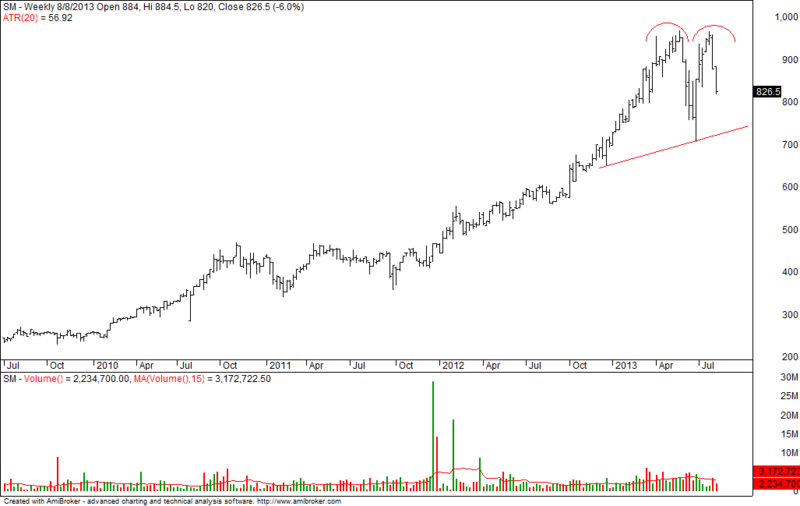 Weekly chart is looking good breaking multi-year highs. Just follow the line of least resistance from this point on. While PSEi had a failed inverse head and shoulders… what makes me more cautious of this market is that there is only one stock that is moving near its highs ($JFC). That’s a clear sign of market participants not confident of this market. Now, I see SM (weekly) approaching a crucial support line. In the dailies, there is also a big gap down due to an overnight placement. A break of its support line and confirmation of this toppish pattern may send the whole market to crash. So, please put SM in your watchlist.